Triangle Fire Systems have been awarded the contract for the design, supply, and installation of the fire sprinkler system at The Ram Quarter Phase 1. The Ram Quarter is an exciting new residential and retail development in Wandsworth. 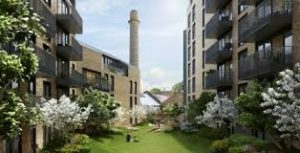 Triangle will be installing a BS 9251 residential fire sprinkler system to 3 residential buildings; Wandle Gardens, Shoreham Gardens and Drapers Yards. The apartments in phase 1 are open to views of the river, gardens, historic buildings and public piazzas. This contract is Triangle’s largest commercial sprinkler order to date, with the installation of a BS EN 12845 commercial fire sprinkler system to a multi-use building complex. The system will comprise of OH3 Life Safety water supplies consisting of Twin Electric Fire Pumps and full holding water storage tank. New wet alarm valves and dry pipe valves are to be installed to serve a mixture of carpark, basements, plantrooms, retail space and loading bays. Design is underway and installation is expected to commence in the New Year.